Would you like a better way to manage your enemies’ parameters and skills? For example, if you have a plugin that gives you enemy levels, you could take advantage of using classes to determine what the enemy’s parameters will be. This plugin allows you to assign classes to enemies. When an enemy has a class, all of their parameters will be based on what class and level they are. By default, they are assumed to be level 1. They will also inherit all of the class features. If no class is provided, they will just read from their own parameters as usual. Download ths plugin and place it in the “plugins” folder in your project’s “js” folder. Then open your Plugin Manager (F10), double-click an empty row, and select the HIME_EnemyClasses plugin. Where the CLASS_ID is the ID of the class you want to set. For example, here, I set Satia to class 1. Where the MEMBER_ID is the position of the enemy, starting from 1. Hi Hime, thank you so much for this amazing piece of art. I am so grateful how much you contribute to this community with your outstanding talent. Just one thing, unfortunately I cannot get my enemies to use the skills that are defined in the classes. Is there a way to solve this? Hello Hime I sent you an email but you may not have gotten it so I thought I’d leave a reply here also. This plugin would be useful to my current project, a project where if the gods shine on me I would hope to be able to sell some day =). I was hoping I could get permission to use this mod if possible before I got to deep into its implementation into my project, in case there are any issues with me using this plugin. Nice work by the way it’s a handy feature. When I was using the plugin, I couldn’t get the enemy to use a skill, however after awhile I figured out how to make it use the skills. I noticed, that in Action patterns, attack was set to “Always” for it’s condition thus preventing the use of the skill, after correcting that, I made sure that my skill had a condition for action patterns. Other than the issue of figuring out how to get enemy to use the skills, I found this plugin very useful. Is there a way to make this work with Yanfly’s Class Base Parameters? I’d like to bump this. Despite putting this plugin below that one, they still don’t play along. I think it’d just be a matter of making this apply changes to enemy database stats after whenever the class equations are applied by yanfly’s plugin. I’d really like that, too. Im getting a problem where the enemy cannot use the skills for its assigned class. If I don’t specify a level for the enemy, would the parameters be taken from the enemy’s data? 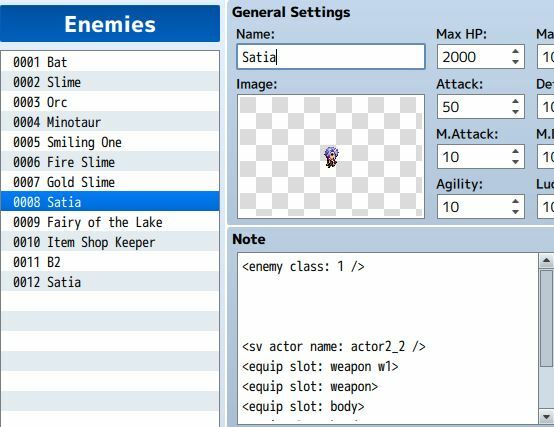 wondering, if you can make this plugin for Actor Classes like this enemy classes? because of the transform and i need to replace the skills. This plugin allows you to add classes to enemies. Actors by default already have classes. What are you trying to do? Actors already have classes by default. How do you get the enemy to actually use one of the skills that is available to its class? I tried changing the default “Bat” enemy to a Mage but all he does is regular attack even though he’s level 20 and should theoretically have a bunch of magic available. I deleted “Attack” from the enemy AI but now he just does nothing. I tried adding the skills to the Mage class’ level 1 abilities, my Hero’s have them just fine. I even added the skill as a trait in the upper right … nothing, the enemy mage just does nothing. I also made sure he had a ton of MP just in case. I’ve been toying around with this script and the level of the enemy doesn’t seem to mach up with the class “skills.” Although it copies the parameters (HP, Str, Def, ect.) The skills I put into the class are not mimicked by the enemy. Any idea on what I could do? Nevermind! I noticed I previously asked this question and had it answered! Ignore this comment! Yay! We shall destroy you Satia! One day… maybe with a pear?